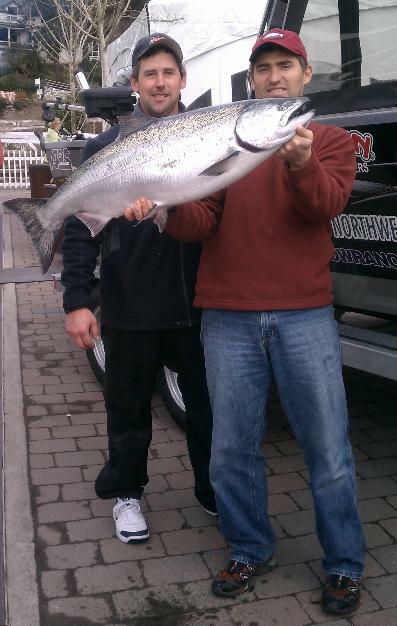 The biggest blackmouth ever landed at the Roche Harbor Salmon Classic was more than enough to win last weekend’s derby. Derek Floyd of Stanwood weighed in a 28.10-pound Chinook — we’re not calling that an immature king, the colloquial phrase for a blackmouth — and took home a cool $10,000 for that. And with the tournament’s top boat weight of a skosh over 108 pounds, good for another $2K, plus he won the side bet, bringing his weekend haul out of the Juans to $21,000. “This fish beats the all-time record blackmouth from this tournament by 2 pounds,” says Tony Floor of the Northwest Marine Trade Association. 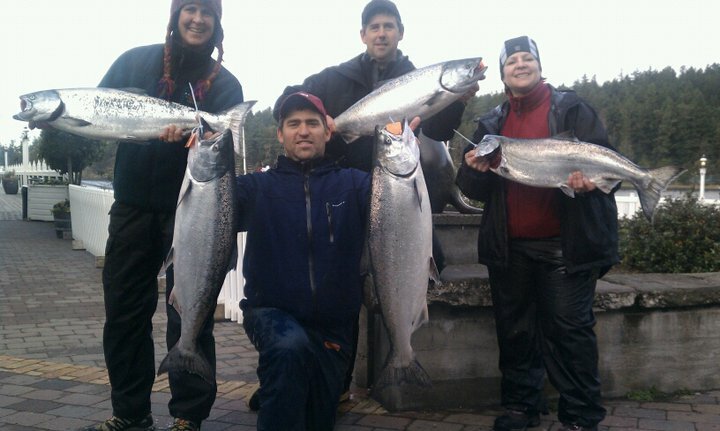 This is the eighth year of the event; it is also the kickoff of NMTA’s Northwest Salmon Derby Series. A total of 100 boats and 337 anglers participated, according to organizers. Thirty-eight of the 100 boats brought in Chinook, 43 on Friday, 25 on Saturday. “Richard Sakuma and mystery weight winner Neal Kamrin both caught their fish in the last minutes of the derby to make this an exciting event until the final bell,” reports Klein. This entry was posted on February 7, 2011 at 8:13 am and is filed under HEADLINES. You can follow any responses to this entry through the RSS 2.0 feed. You can leave a response, or trackback from your own site.